Officials at the inauguration of the show in Taipei. 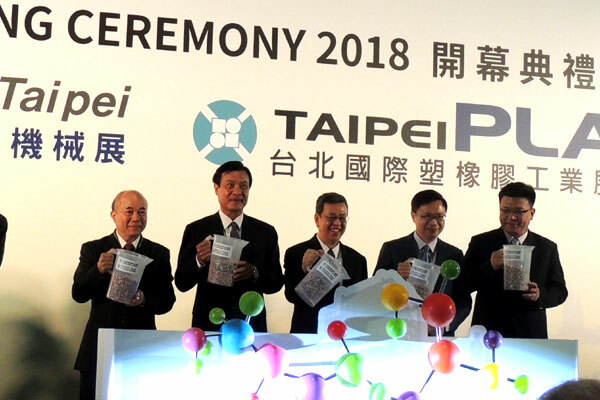 The 16th Taipei Plastic and Rubber Industry Show (TaipeiPLAS) opened in Taiwan capital Taipei today (August 15) with more than 530 companies showcasing their latest innovations in machinery for the plastics industry. The five-day expo, running till August 19 at the Taipei Nangang Exhibition Center, covers the plastic and rubber processing machinery, injection molding machinery, blow molding machinery, extruders, printing machinery, auxiliary equipment, molds and dyes, parts and accessories, raw materials, semi-finished and finished products for the plastics sector. This year, the biennial show is co-hosting the Taipei International Shoe Making Technology Show 2018 (ShowTech Taipei) also. The shows are being organised by Taiwan External Trade Development Council (Taitra) and Taiwan Association of Machinery Industry (Tami). Opening the event, Taiwan's Vice-President Dr Chien-Jen Chen promised government help to the sector and underlined the importance of machinery industry and the sector's exports for the country's economy. Last year, the plastic and rubber machinery sector exported products worth $1.2 billion across the globe. The exhibition is one of the top three plastics and rubber trade show in Asia and reflects Taiwan's growing influence in this sector, said James C F Huang, chairman of Taitra. TaipeiPLAS is a highly recognised procurement platform for the global industry and exhibitors from more than 20 countries are taking part in the show. Over 20,000 professionals are expected to attend, he said. The show is themed around "Reducing carbon footprint and providing green products'; 'Smart manufacturing and machine systems'; and 'Aesthetic design and upgrading towards Industry 4.0 to enhance product value'. Several industry players and expo exhibitors emphasised the importance of Industry 4.0, artificial intelligence and machine learning with Smart machines and robots taking pride of place at the show.